There will never be another dog like beautiful little brown Ann. This entry was posted in Tilly and Mabel and tagged dog, dog memorial, pet, pet bereavement, pet loss, pet memorial, pet poetry, poetry, rainbow bridge on March 14, 2018 by Jean. Tilly and Mabel have been with us for four years now and we love them to bits. But I really did not want them. Doesn’t that sound awful. 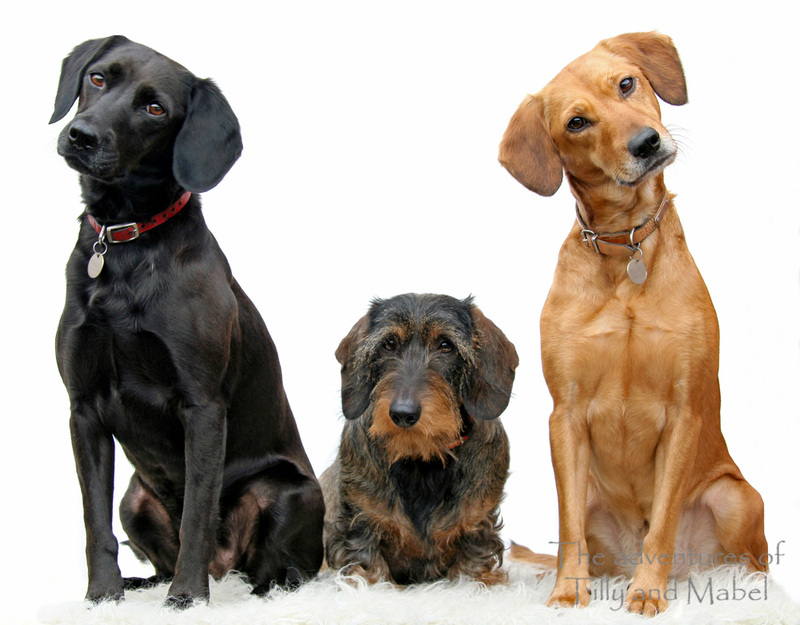 But if things had gone according to plan we would still have have had three dogs called Annie, Jess and Rosie. Rosie is the vertically challenged one in the middle, beautiful black Jess is on the left and little brown Annie is on the right. Annie and Jess joined us at 10 weeks old…advertised in our local shop as labrador/spaniel cross’s, the last two pups from a litter of ten that nobody wanted. We went along to bring home one of them and somehow came home with two. Best buy one get one free I have ever had! 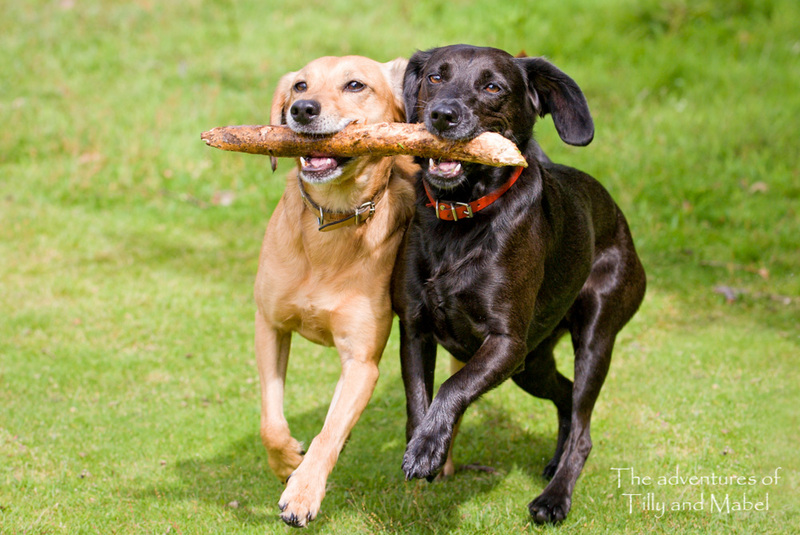 For ten years Annie and Jess slept together, played together and fetched sticks together. In April 2011 Jess stopped eating. We took her to the vet who took scans and gave us the worst news possible. She had cancer in her throat which had spread to her internal organs. Two weeks later on Good Friday, a beautiful sunny spring day, Jessica was put to sleep on our lawn in the sunshine. We buried her in the garden. From that day on I wanted her back. We had to find another black Labrador Spaniel cross and bring her home. I would travel as far as it took. But another Jess could not be found. My friend told me about a litter of Sprockers that would be available shortly and we went to look. I didn’t like them…they weren’t Jess. However Richard my husband fell in love with them and, desperate to fill the hole in my heart, three weeks later we collected Tilly and Mabel. And so their adventures began. Annie is now 14 years old, still going strong and enjoying life. In a perfect world Jess would still be on the other end of her stick. 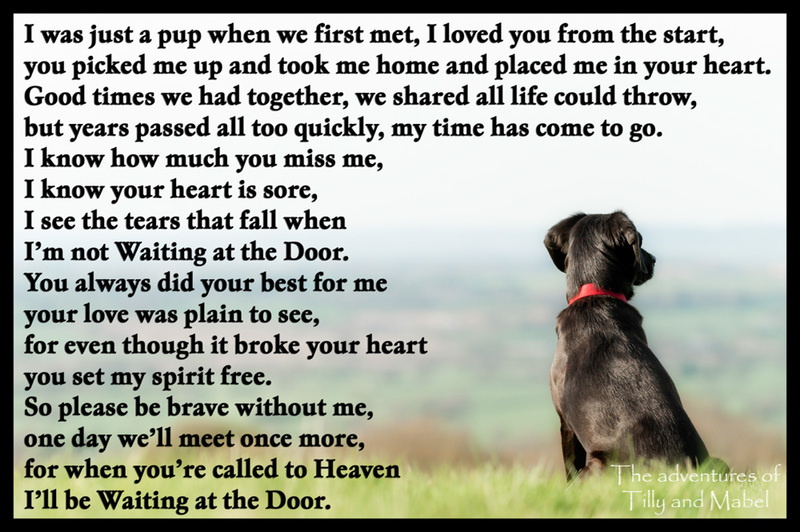 This entry was posted in Tilly and Mabel and tagged animal, bereavement, cocker, dog, euthanasia, labrador, memorial, pet, pet bereavement, pet loss, poem, poetry, spaniel, springer, sprocker, verse on August 23, 2015 by Jean.